Before you get started learning about Scala algorithm development, make sure you go through our Getting Started Guide to learn how to create your first algorithm, understand permissions available, versioning, using the CLI, and more. 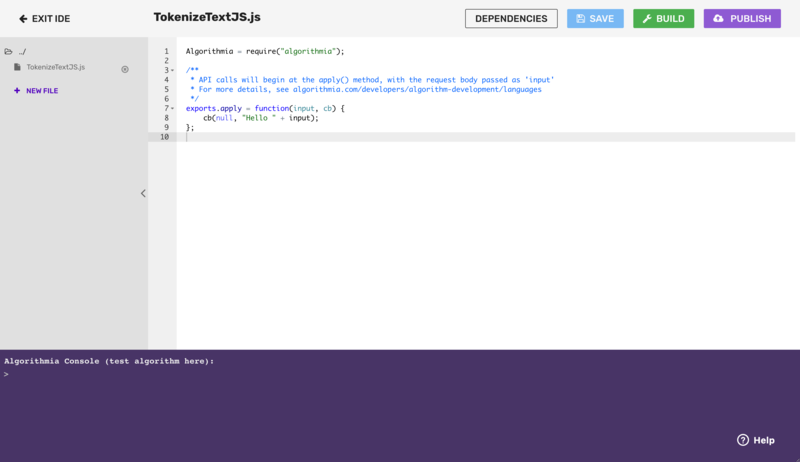 Algorithmia makes a number of libraries available to make algorithm development easier. Furthermore, algorithms can call other algorithms and manage data on the Algorithmia platform via the Algorithmia NodeJS Client. If you’ve followed the Getting Started Guide, you’ll notice in your algorithm editor, there is boilerplate code that returns “Hello” and whatever you input to the console. The main thing to note about the algorithm is that it’s wrapped in the apply() function. The apply() function defines the input point of the algorithm. We use the apply() function in order to make different algorithms standardized. This makes them easily chained and helps authors think about designing their algorithms in a way that makes them easy to leverage and predictable for end users. Now that you have created your algorithm, you can add dependencies. The algorithm we are about to create does not have any dependencies other than algorithmia (which is added by default), but it is important to know how to do this - so for now we’ll add lodash just as an example. Now click “Save dependencies” to close the modal window. Note that you will still need to import your package to your algorithm file. The first algorithm that we’ll create will take a JSON formatted object, which has been passed as input by the user. However, you don’t need to worry about deserializing the JSON; it is done automatically before the call to apply(). Below is a code sample showing how to create an algorithm working with basic user input. You’ll also see some error handling within the algorithm, but we recommend that you take a look at our Better Error Handling Guide for more information. Note, that if the input to your algorithm is a bare string (e.g. "world"), then typeof input will be ‘string’. However, we do not recommend accepting bare strings (JSON-encoded Objects are preferable), so we’ll return an error message in that case. Go ahead and type or paste the code sample above in the Algorithmia code editor after removing the “Hello World” code. Note that this returns well-formatted JSON which will be easy for the user to consume. You’ll get a similar result by passing in just [8,6,7,5,3,0,9], but giving it a bare string or an Object without a “value” property will return an error message. When you are creating an algorithm be mindful of the data types you require from the user and the output you return to them. Our advice is to create algorithms that allow for a few different input types such as a file, a sequence or a URL. This next code snippet shows how to create an algorithm working with a data file that a user has stored using Algorithmia’s Hosted Data Source. 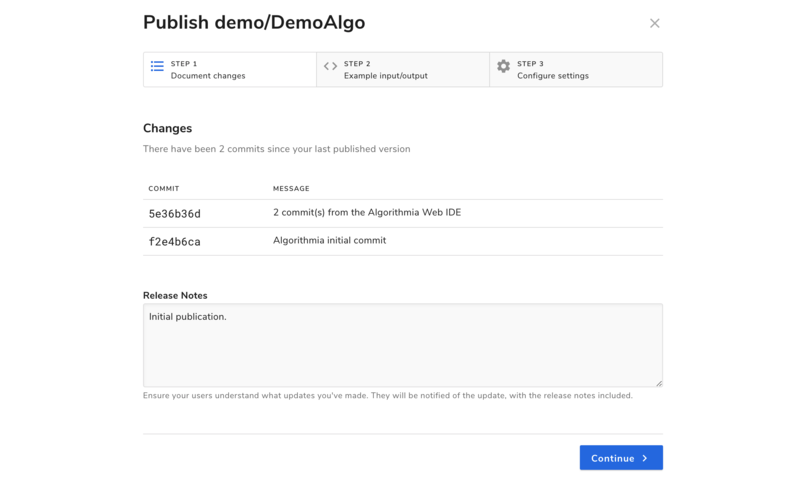 While users who consume an algorithm have access to both Dropbox and Amazon S3 connectors, algorithm developers can only use the Algorithmia Hosted Data Source to host data for algorithm development. If you wish to follow along working through the example yourself, create a text file that contains any unstructured text such as a chapter from a public domain book or article. We used a chapter from Burning Daylight, by Jack London which you can copy and paste into a text file. Or copy and paste it from here: Chapter One Burning Daylight, by Jack London. Then you will can upload it into one of your Data Collections (create a collection, drop the file into the “Drop files here” area which appears at the bottom of the page). After you paste the above code into the Algorithmia code editor you can compile and then test the example by passing in a file that you’ve hosted in Data Collections. 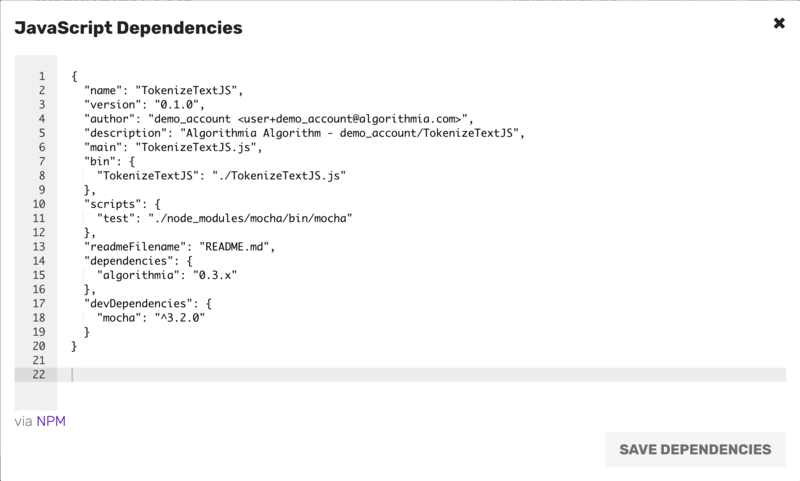 To call other algorithms or manage data from your algorithm, use the Algorithmia NodeJS Client which is automatically available to any algorithm you create on the Algorithmia platform. For more detailed information on how to work with data see the Data API docs. When designing your algorithm, don’t forget that there are special data directories, .session and .algo, that are available only to algorithms to help you manage data over the course of the algorithm execution. You may call up to 24 other algorithms, either in parallel or recursively. For more information on error handling see the Better Error Handling Guide. Before you are ready to publish your algorithm it’s important to go through this Algorithm Checklist and check out this blog post for Advanced Algorithm Development . Both links will go over important best practices such as how to create a good algorithm description, add links to external documentation and other important information. Once you’ve developed your algorithm, you can publish it and make it available for others to use. In this modal, you’ll see a Changes tab, a Sample I/O tab, and one called Versioning. Changes shows you your commit history and release notes. Sample I/O is where you’ll create your sample input and output for the user to try under Try the API in the Run tab. When you add a sample input, make sure to test it out with all the inputs that you accept since users will be able to test your algorithm with their own inputs. Under the Versioning tab, you can select whether your algorithm will be for public use or private use as well as set the royalty. The algorithm can either be royalty-free or charge per-call. If you opt to have the algorithm charge a royalty, as the author, you will earn 70% of the royalty cost. Check out Algorithm Pricing for more information on how much algorithms will cost to run. Under Semantic Versioning you can choose which kind of release your change should fall under: Major, Minor, or Revision. If you are satisfied with your algorithm and settings, go ahead and hit publish. Congratulations, you’re an algorithm developer! In this guide we covered how to create an algorithm, work with different types of data and learned how to publish an algorithm.